When decorating your home it’s not often that another option than curtains are thought about when looking at the windows. For bedrooms and lounges especially, curtains ooze the style and sophistication you need when decorating. But window blinds offer a stylish aesthetic appeal that’ll be fantastic for kitchens and bathrooms and with a range of styles and designs there’s something for everyone. Window blinds are gaining popularity all over the UK and now have become an integral part of a home’s décor. With plenty of types to choose from, you have many options and below we highlight what’s available. 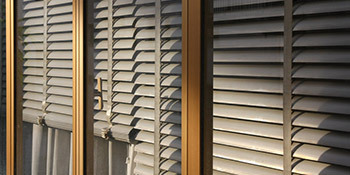 Vertical blinds, otherwise known as track blinds, are made from vertical slats attached together. This type of blind is perfect for large windows and doors and are great blinds for bay windows. With a range of materials, spanning from aluminium to wood and stiffened plastic, you can find something that’s in keeping with your room’s design. For functionality, roller blinds are number one, used in offices as well as homes. Typically, this range tends to be made from plastic and is beneficial for bedrooms and they stop light from entering the room when fully closed. Roller blinds as seen as elegant, yet simple and highly versatile. With a whole host of colours and designs you can find something to suit your individual taste. Roman blinds are very similar to the roller blinds and can be moved up and down easily throughout the day. They look great for the luxurious bedroom effect and are typically made from softer fabrics. One of the most popular designs, Venetian blinds are made from horizontal slats and suspended from a cord or strips of cloth. They can be rotated up to 180 degrees, giving you complete control over how much light is allowed into the room at any one time. Available in a range of materials stretching from metal to woods and plastic, they’re perfect for anyone wanting a stylish finish. With windows blinds you have the opportunity to complete your room’s look with a stylish and decorative feature for the windows. With a variety of benefits and styles you can find something that’ll suit any room in your home. For up to four FREE window blind quotes from local, vetted and reputable professionals, just complete our quick form below. Project: small door roller blackout window blind. The below information indicates the energy performance of properties in Uk. Energy ratings range from A to G, with A being the most energy-efficient and G being the very least efficient. The Energy Performance Certificate (EPC) rating comes into play heavily if you want to sell your house, as possible buyers will see how much they're probably going to be spending on their heating expenses. Home upgrades such as insulation assist to drastically improve a home's EPC rating. There are numerous types of property in the United Kingdom and the data underneath shows the type of housing within Uk. Over the country the most popular housing types are typically semi-detached and terraced housing, but detached homes, flats and bungalows are also available. The pie chart below displays the proportion of houses within Uk which are central heated and non-central heated. Central heating figures within the vast majority of UK homes, which includes those on the gas grid and properties heated by oil and electric. The information below illustrates the spread of properties warmed by various fuels. Around the United Kingdom the most common undoubtedly are gas heated homes, followed by electricity and then oil. Biomass central heating boilers are also growing in popularity, heated by green products including wooden pellets or agricultural waste.|Homes in the UK are heated by a variety of fuels, such as gas, electricity, oil, solid fuel and LPG boilers. Each fuel has a varying cost associated with it and that means you can find yourself with more affordable energy bills by switching how your house is heated. Even solar thermal panels are being regarded as by many as a way to cut heating bills for the years to come.